What are we to make of a show that calls itself Art of Change: New Directions from China ? I don’t think it’s worth discussing new directions in the context of Chinese art – there were no old directions, either. Chinese art has never had any clear orientation. Yes, the artists in this exhibition, which opened at the Hayward gallery in London last week, have struggled against the limitations imposed by the Chinese state more stridently than others. But that doesn’t change the fact that this is just another attempt to introduce western audiences to so-called “contemporary Chinese art”. How can you have a show of “contemporary Chinese art” that doesn’t address a single one of the country’s most pressing contemporary issues? I am very familiar with the work of most of the artists in the show. Their work is certainly Chinese but, overall, the show casts no critical eye. It is like a restaurant in Chinatown that sells all the standard dishes, such as kung pao chicken and sweet and sour pork. People will eat it and say it is Chinese, but it is simply a consumerist offering, providing little in the way of a genuine experience of life in China  today. China is an old nation with a colourful history. Its booming economy has triggered an appetite and a curiosity around the world for its art and culture, one that continues to grow. I can, however, tell people that it is a show with no actor. The Chinese government is spending billions on “soft power” initiatives, desperately promoting cultural exchanges with the west, with the goal of presenting itself as a civilised nation. These are superficial gestures, no different from the ping-pong diplomacy practised in the 1970s by Chairman Mao : American table-tennis players were invited into the country to play fun matches and thereby facilitate some sort of political relationship. In a similar vein, giant pandas were given as gifts to various countries to strengthen diplomatic ties. Last year, we saw China bringing its propaganda right into New York’s Times Square . In an advertising push that the state news agency Xinhua described as a “public diplomacy campaign”, billboard-size screens played videos that featured martial-arts movie star Jackie Chan , basketball player Yao Ming , astronaut Yang Liwei , and pianists Lang Lang  and Li Yundi . Meanwhile Confucius Institutes, promoting Chinese culture, are spreading all over the world , as are Chinese travelling acrobatic troupes. To me, these are an insult to human intelligence and a ridicule of the concept of culture – vehicles of propaganda that showcase skills with no substance, and crafts with no meaning. Although Chinese art is heavily influenced by contemporary western culture, it rejects the essential human values that underpin it. The Chinese Communist party claims to deliver socialism with Chinese characteristics, but nobody understands what this means – including the people of China. Given this, and their lack of self-identity, there is no reason to expect a show of Chinese art created in the west to critique the system effectively. But any show curated without respect for the people’s struggle, without concern for an artist’s need for honest self-expression, will inevitably lead to the wrong conclusion. Anything that calls itself a cultural exchange is artificial when it lacks any critical content. What’s needed is open discussion, a platform for argument. Art needs to stand for something. 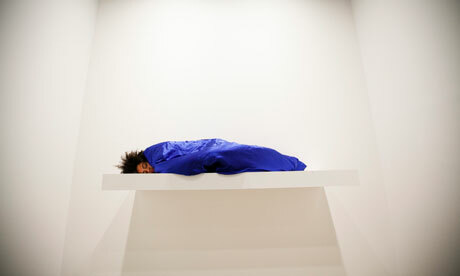 • Art of Change: New Directions from China is at the Hayward Gallery, London SE1, until 7 December.